I’ve been musing over that well-known passage in Genesis 12: 1-3 where God tells Abraham that he will bless him abundantly, but the blessing has a BIG purpose. It is meant to produce a blessing to others and by it all the people of the world will be blessed. This promise is considered a banner covenant in the Bible and one that I have been taught all my Christian life applies to us, as well. We are blessed in order to be a blessing. I’ve been thinking how this wonderful biblical principle applies to the Oromo Evangelical Church in their new church home and the miraculous speed by which this all transpired. Why was God in such a rush after all these years of struggle, and after a dusty Mission Loan Fund had been on the books at Upper Arlington Lutheran Church (UALC) for 3 decades? Why was God in such a rush now? Is there something deeper going on? For me it was clear that God was on the move, doing something BIG, but what? Was it just to provide a needed home for this small, growing, Oromo speaking congregation? Or was there something far bigger afoot? 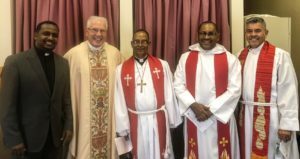 The story began last summer when the council of UALC was approached by the Oromo congregation for funding out of our Mission Loan Fund. Incredibly this fund had been on UALC’s books for decades as a result of faithful members many years ago who pledged that a portion of their gifts for a UALC building expansion would also be used to help other missions grow. The fund had been sitting idle for years with a balance of $151,000. Initial meetings led to an enthusiastic partnership to help the Oromo leaders find more suitable space. It began with an extensive, but fruitless, property search with many property visits and head scratching. My initial ‘back of envelope’ calculation showed that the absolute most the Oromo congregation could afford would be $1.2 million, based on getting a loan with a down payment from the Mission Loan Fund. New construction was financially out of the question so we focused on renovating existing space. In November, while studying the problem, I was discouraged. Nothing seemed to work. There simply was not enough money to provide enough space for this growing congregation. That evening I started searching the internet again for other properties and miraculously a brand-new listing for a church just outside of our target area showed up. It seemed perfect if perhaps a little out of the way and the price….$1.2 million! But we would have to move fast. We all met at the property 48 hours later and I will never forget Oromo pastor, Teshome’s excited reaction as he walked through every room in this large church exclaiming, “Oh Lord Jesus” and when he saw the huge gymnasium there was an even louder exclamation, “Oh Lord Jesus.” It was then that he coined the phrase, “God is on the move”, never losing faith that God had intended this vacant church for them which was much larger than any of us had dreamed. There were exhaustive details in our work to swiftly accomplish this purchase, but a few were clear signs to me of God’s direct intervention. God was on the move! Let me mention six. Mission Loan Fund: Over thirty years ago, faithful UALC members had a vision of helping to launch other mission efforts. This visionary fund launched this effort which would not have been possible without it. Saturday night property search: Is it a coincidence that at the very moment of discouragement the perfect opportunity arose, at the exact price we needed? Loan: Banks were appropriately cautious about lending to a small, poor congregation. In the end, only one bank would agree to the loan at exactly the amount we needed to proceed. Oromo congregation: In a one-night appeal, members of this immigrant community pledged $41,000! Incredible! UALC support: The initial request to the Mission Loan Fund was met with enthusiastic support from the congregation with funds growing to $267,000 and received a standing ovation on Sunday morning! NALC support: We had to move fast! Bishop John Bradosky’s leadership was essential to inspire the Ohio Mission Region to interject an appeal into their busy Advent season. The result was incredible! Lutheran churches throughout the region raised the needed $100,000 in record time and exceeded the goal by an additional $30,000! We now had more funds than we ever imagined! The dream of a church home, that began years before, materialized in an instant. Why was God in such a rush now? Could it be because there are now estimated over 200,000 Oromo speakers in the US and over 5,000 in Columbus? Could it be that many of these Oromo speakers have never heard the Gospel? Could it be that Columbus is a destination for many of these new immigrants? Could it be that he wanted UALC to get out of the suburbs and into this mission field? I don’t know the answer, but I have a strong sense that this miracle has much more in it than just a well-deserved church home for a small, growing congregation. God is on the move here. In Jeremiah 31:2-3 we read: “Thus says the Lord: ‘The people who survived the sword found grace in the wilderness; when Israel sought for rest, the Lord appeared to him from far away. 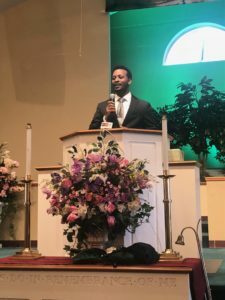 I have loved you with an everlasting love; therefore I have continued my faithfulness to you.” Pastor Gemechis Buba shared during the dedication that it was a blessing and honor to see the faithfulness of God. Six and seven generations before this young man and his daughter, a man boldly stepped out in faith as he provided the first translation of the Bible in Afaan Oromo. This was illegal and dangerous – but today, here his descendants stood together with all gathered for the worship celebration. All chosen and baptized children, because the Word of God is living and active. Pastor Buba remarked that the humble and courageous actions of this one man were used greatly by God, and God is still on the move choosing to use each person gathered to share the Good News of Jesus Christ. The Gospel singer Dasta Hinsarmuu traveled from Alberta, Canada to assist in leading worship during the dedication. As pictured here, he shared the story of when he was 8 years old and Pastor Teshome visited his small village. 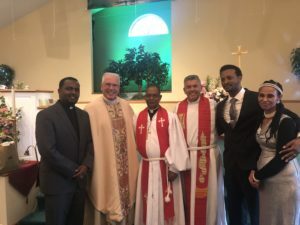 Dasta shared that the journey was long for both him and this congregation, but on this day he stood, as a specially invited guest to this thriving, Oromo congregation in Columbus, Ohio, as they dedicated their new home. He stands as a testimony to the faithfulness of God and fruit of the ministry Pastor Teshome has long embarked on in sharing the Good News of Jesus Christ. Tom Slemmer is the past chair of Upper Arlington Lutheran Church in Columbus, OH. 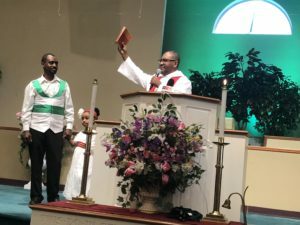 For more information or to support Oromo Evangelical Church in Columbus, please visit: The Great Commission Society.